It's April value was essentially the same as its March value. In the context of the other housing data we have, we can stop wondering whether housing hit bottom this spring -- it did. Recall that the Case-Shiller index is a 3-month moving average, so this result may indicate that the pure April data showed higher prices than did the February and March data. Sean MacLeod kindly provided this graph comparing various indices, although here it is hard to see that the CS March-April decline was indeed small. Below is my chart, which expresses housing prices as a ratio to construction costs, and shows them together with construction activity. Take a single person who earns $50,000 per year. Each 1000 dollars she adds (subtracts) from her income adds (subtracts) from her monthly student loan repayment by $89. Moreover, if her income goes above $60,000 (below $40,000), the 8.9% cap becomes a 10.9% (2.8%) cap. This is a further erosion of work incentives, and will take yet another bite out of national employment. Some of this just affects the maturity dates of the loans, but loan maturity dates are also capped. I'll report back with a marginal tax rate calculation, but the basic analysis here is as with my analysis of home mortgage forgiveness (see here, here, here, here, here, here, here, and here). A New York Times article today suggests that so many borrowers are aware of the possibility of mortgage modification that mortgage servicers cannot process all of the applications. The industry is expanding capacity in this regard, says Michael S. Barr (the assistant Treasury secretary for financial institutions), and will soon be processing 20,000 applications per week. My forecast is that 2009 Q2's real GDP will be 1 percent lower than 2009 Q1's. Annualizing that forecast, it's -4.2 percent. We already know about the job losses through May, and my guess is that (as in previous quarters) these losses continue to be a movement along a stable labor demand curve. Real consumption expenditure rose in May, after two months of decline. As of May, real consumption expenditure was higher than it was in any of the months Oct-Dec 2008, but lower than it was in the first part of 2008: consumption is not back to what it was, but not as low as we thought it might get. The BEA reported that real disposable personal income was $2478 per person in May 2009. The only month in U.S. history higher than that was May 2008 ($2499). Based on the recent trends, I expect that June 2009 (which is almost over) will have the highest real disposable personal income ever. Compared to a world in which real GDP remained at the (thusfar) all time high (achieved in 2008 Q2), the BEA's report this morning shows that through 2009 Q1 the U.S. economy had lost $181 billion (measured at 2008 Q4 prices). MUCH less than government spending on "stimulus"
Hopefully, some political entrepreneurs will soon find it optimal to put the "crisis" in perspective and protect the taxpayer from further losses. Later the BEA gave its advance estimate of -1.57 percent, and I said that the BEA would eventually revise 2009 Q1 real GDP up (that is, determine that the Q4-Q1 growth rate was less negative than indicated by the advance estimate. Later still, the BEA revised the real GDP growth estimate to -1.47 percent, and I said that they still have upward revisions to do (in part because Q1 productivity was looking better than I had initially thought). This morning, the BEA gave its final estimate of -1.40 percent. I look at the NY Fed's Economic Data Release calendar almost every day. Now I hear that they have developed an international financial crisis timeline. A primary theme of behavioral economics is that consumers are poorly informed and otherwise unable to wisely consider the important decisions in their lives. As behavioral economics has gained some academic acceptance, it is no surprise that taxpayers are getting less respect too. Before the behavioral economics wave, we economists used to say that taxes hurt the economy because they cause people to change their behavior in order to pay less to the Treasury. Virtually all of us agreed that this harm is real, even while we disagreed as to whether that harm was a price worth paying in order to get revenue into the Treasury. The new wave is to deny this harm in many instances, on the grounds that taxpayers are ignorant of the taxes they pay. One application of this argument is to means-tested mortgage modification. Coming from the old school, my analysis (here, here, here, here, here, here, here, and here) said that reducing mortgage debt primarily for borrowers with low incomes will only encourage borrowers to earn less income. The new school says that analysis is hardly relevant, because borrowers are ignorant of how things work. Below is my first attempt at a rebuttal. Means-tested mortgage modifications are based on incomes in the recent past: usually income for the prior calendar year. In theory, taxpayers could have supplied income during year 0 without knowledge that their supply decisions would affect what they would obtain from a mortgage modification or other transaction that would ultimately occur in year 1. 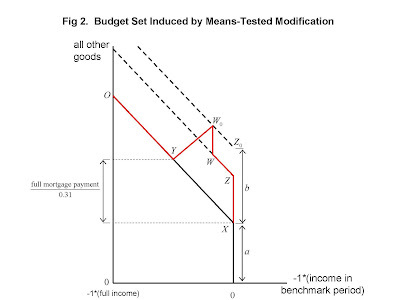 In other words, this theory posits that few anticipated that their budget constraint was shaped like the one shown in Figure 2. In this case, the means-tests that are part of mortgage modification and other transactions would not distort the supply of income, or at least not distort it any more than they did prior to the housing crash. Of course, labor market participants do not have perfect foresight, and may not see things that the experts do. There likely are homeowners who had their mortgages modified who, with the benefit of hindsight, would have supplied less income. However, for several reasons, perfect foresight is not required for means-tests to have an important aggregate impact. Some homeowners may have over-estimated the size of the means test. There may be renters who (incorrectly) expected their rent to be means-tested during a well-publicized recession. Once we admit that foresight is imperfect, we have to recognize that there are also instances when people anticipate a larger means-test than actually occurs. Imperfect foresight can dull some of the detailed implications of the theory of tax effects – eg., that behavior should change more for groups who face the larger marginal tax rate ex poste – even while aggregate tax effects are large. (Raj Chetty and coauthors have a recent paper in this spirit). Although foresight is imperfect, it is likely that many people did understand that mortgages would be modified primarily for people “in financial trouble.” Means-tested mortgage modification occurred during the 2001 recession (Sichelman 2001). A number of homeowners had their mortgages modified twice during this recession – even if the means-test surprised them the first time, did it surprise them a second time? Many homeowners have a large amount at stake. It is intuitive that mortgage modification would be means-tested – why would a lender reduce mortgage payments for his income rich borrowers? Consistent with this intuition, I have shown that means-tests are lender-profit maximizing even if those tests create labor market distortions. For these reasons, many homeowners should have expected that mortgages would be reduced primarily for those in financial distress. Data on internet use and other behaviors also suggests that millions were aware. Finance.yahoo.com has tens of millions of unique visitors a month, and consistently displays headlines about mortgage modification with links to detailed information about what homeowners can expect from lenders and the modification process. Perhaps ironically, the Bush Administration sought to raise homeowner awareness (Swagel, 2009, p. 12). Among other things, it promoted its national foreclosure counseling hotline (888-995-HOPE). During 2007, its quarterly call volume increased almost tenfold to 143,000. 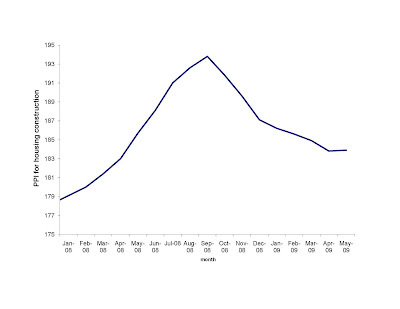 For the months of January through November 2008, cumulative call volume was over 1,000,000. Those calls led to almost 300,000 counseling sessions that “guide callers through a thorough analysis of their financial situation.” Daily call volume tripled again in March 2009 when the Obama plan was announced. Although we may never know exact numbers for homeowner awareness, these bits of data suggest that the number of homeowners aware that mortgage modification is conditioned on financial distress was easily in the millions already in 2008. Commenters: what do you think? Forbes.com “Forbes.com Traffic Surges in December.” January 22, 2009. Homeownership Preservation Foundation. “Nation’s Foreclosure Prevention Hotline Shatters Previous Call Records.” Press Release, January 15, 2008a. Homeownership Preservation Foundation. “Foreclosure Prevention Hotline Helps over 1 Million Homeowners.” Press Release, December 22, 2008b. Homeownership Preservation Foundation. “Obama Foreclosure Plan Sparks Large Spike in Calls to Homeowner Hotline.” Press Release, March 19, 2009. ComScore reported that finance.yahoo had 17.538 million visitors in June 2008 (before the financial crisis reached its peak newsworthiness), and that it was the leader among financial websites (McIntyre, 2008). The same report listed forbes.com’s visitors at 5.797 million. By December 2008, Forbes reported that its website had 20 million unique visitors per month, which was a 46 percent increase from the year before. Thus, finance.yahoo’s December 2008 traffic must have been well over 20 million. Homeownership Preservation Foundation (2008b). Total call volume for 2008 (including December) was 1.2 million (Homeownership Preservation Foundation, 2009). The Next Inflation: When, Why and So What? More inflation is on the horizon. However, this inflation will have significant benefits and, in any case, cannot be blamed on the Obama administration’s deficit spending. Many economists and bond market commentators complain that inflation is on the horizon. One of the culprits, they say, is the large amount spent by the Obama administration on the fiscal stimulus, and potentially to be spent on health care reform. They claim that federal spending increases demand and thereby increases prices. Even if it were true that stimulating demand would create inflation, this blame is misplaced because the fiscal stimulus has not, and health care reform will not, significantly stimulate demand. Even before the “stimulus” spending started, it was clear to me that the larger effect of the fiscal stimulus would be to reduce private demand and raise public demand, without much effect on total demand. The recent evidence has already begun to confirm the minimal aggregate impact of the fiscal stimulus: The unemployment rate in May was nowhere near as low as what the Obama administration had claimed it would be as a result of a passing a stimulus bill. Despite some notable exceptions — such as interwar Germany — there is little or no correlation between government spending and inflation rates. Thus, even if the stimulus law and forthcoming health care laws increased total demand, there is still no guarantee that inflation would result. The second purported culprit is the dramatic increase in the quantity of money. 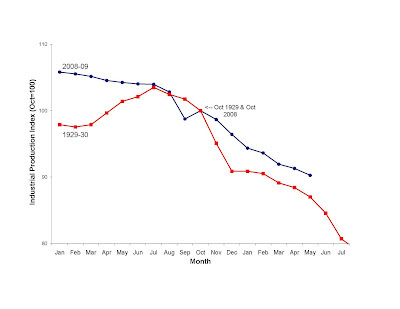 The red line in the chart below illustrates this perspective — it measures the monetary base (that is, the value of currency, coin and Federal Reserve deposits) in each month through July 1930, normalized so that October 1929 is 100 (for example, the value of  in April 1930 means that the monetary base was 98 percent of what it was in October 1929). 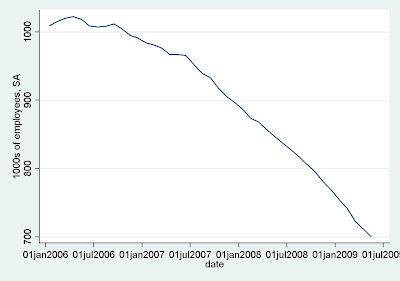 The blue line measures the monetary base for 2008-9. Unlike 1929, the monetary base surged in October, November and December, for a cumulative increase of about 50 percent. With a couple of caveats, such a large expansion of the monetary base should increase prices in the economy — that is, create inflation. One caveat is that, although the monetary base surged more than six months ago, the inflation has not happened yet. Part of the reason for the weak short-run link between inflation and the monetary base is that, these days, banks seem willing to hold excess reserves at the Fed. Second, it is conceivable that the Federal Reserve could contract the monetary base before inflation resulted. But that begs the question: Will the Federal Reserve contract the monetary base enough — and with the right timing — to prevent inflation? Some argue that the Federal Reserve does not have the political fortitude to endure the high interest rates that would supposedly result from such a contraction. I doubt that much endurance would be required, though, because the low interest rates that were created by the base expansion were so short-lived — such would be the length of time that a monetary base contraction would raise interest rates. More importantly, the Federal Reserve, and bankers more generally, recognize that some inflation would alleviate, although not fully erase, some of the damage done by the housing market to the wider economy. Specifically, inflation would raise the prices of a great many commodities, goods and services, among which would be the price of housing. Higher housing prices would pull a number of mortgages out from under water — the case when more is owed on a mortgage that the market value of the house that collateralizes it — and thereby reduce the number of foreclosures. The positive effects of inflation are why it is unlikely that there will be enough support at the Fed for reducing the monetary base in a way that would be consistent with low inflation. The inflation we will likely see in the coming months and years will not be an accidental by-product of big government spending, or an inability of the Federal Reserve to appreciate that money growth creates inflation. Rather, inflation will be a deliberate choice to reduce the housing market’s drag on the wider economy. The OFHEO (now known as the FHFA) reported this morning that housing prices fell slightly from March to April. 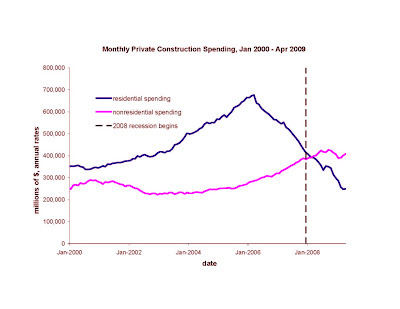 However, note that construction prices fell significantly from March to April. If these indices are right that construction costs fell more than housing prices, then residential construction activity should stop falling. In other words, the news to me in today's report is that housing prices did not fall as much as construction costs. 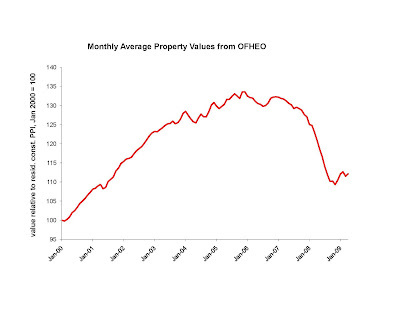 The chart below graphs the OFHEO housing price index, expressed as a ratio to the PPI for residential construction. The NAR housing price measure showed a decrease March to April, but showed an INcrease April to May, with May's value higher than March's. We'll see next week whether the Case-Shiller housing price index shows anything like these others. This blog is supposed to be about the economy, not economists. The last two weeks may appear to be an aberration -- I have written a couple of times about John Maynard Keynes and Milton Friedman. While names like those attract attention, IMO it is the economic activity that's worth attention. And some of the economic activity today has close parallels with the activities Keynes and Friedman observed decades ago. The two charts below graph the CPI for today and 1929-30. I have only non-seasonally adjusted for 1929-30; the first (second) of the two charts uses NSA (SA) for today. Do we have inflation yet? It depends how seriously you take the seasonal adjustments. But at least we do not (yet) appear to be headed down the CPI plunge that began May 1930. Six months ago, the Federal Reserve chairman, Ben S. Bernanke, announced that he might widen the scope of monetary policy by purchasing long-term Treasury securities. Market commentators had high expectations for the results of Mr. Bernanke’s new actions, but the results so far have been what Milton Friedman anticipated: disappointing in terms of both interest rates and inflation. More than 40 years ago Mr. Friedman said in his famous address to the American Economic Association that “we are in danger of assigning to monetary policy a larger role than it can perform, in danger of asking it to accomplish tasks that it cannot achieve” (American Economic Review, March 1968, p. 5). Perhaps because Mr. Friedman’s warning was 40 years old, or because it was offered during “normal” times, or because the financial crisis rekindled the fantasy that our government can control the economy, Mr. Friedman’s warning was ignored last December. Mr. Bernanke said his approach would help “spur aggregate demand.” Market commentators went further and said that long-term rates would fall, and that this would help people buy homes and help businesses make investments. Milton Friedman warned “The initial impact … is to make interest rates lower for a time … after a somewhat longer interval, say, a year or two, [this would] return interest rates to the level they would otherwise have had.” (p. 6, emphasis in the original). Was Milton Friedman right? Or did Mr. Bernanke’s shift stimulate the housing market? 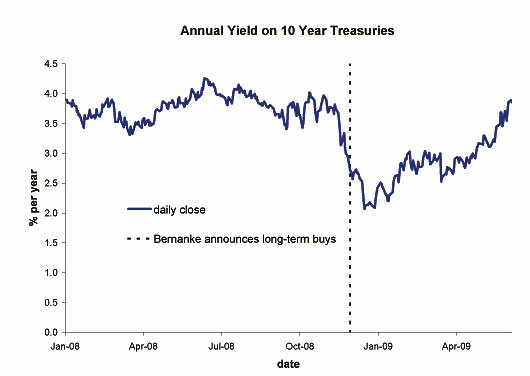 The chart below graphs the yield on 10-year Treasuries for the days of 2008 and 2009, together with a vertical line indicating the day of Mr. Bernanke’s announcement. It suggests that Mr. Friedman’s warning — considered somewhat radical at the time — was actually too modest for today. Yes, Treasury yields did drop the day Mr. Bernanke made the announcement and later that month reached a low of almost 2 percent. But yields closed at almost 3 percent — higher than when Mr. Bernanke made his announcement — only 67 days later. By now, long-term Treasuries yield 3.5 percent to 4 percent — typical of the range of yields during most of last year, before Mr. Bernanke made the policy change. If monetary policy cannot have much of an effect on long-term interest rates — the rates that drive housing and capital markets — what can it do? It might try to maintain a steady rate of inflation, but Mr. Friedman said even that might prove too difficult because of the weak short-run links between monetary policy and inflation. Mr. Friedman seems to have been correct about that, too, because prices have fallen much as they did in 1929-30, despite the differences in monetary policy. Milton Friedman was right that “it would constitute a major improvement if the monetary authority followed the self-denying ordinance of avoiding wide swings.” (p. 16) He certainly was right about the consequences of doing otherwise. In monetary theory, we assume that fiat currency can be supplied at zero marginal social cost, because the costs of paper and ink are negligible compared to the value of the paper commands as currency. The Alaskan economy offers a slight deviation from that assumption. Of course, they use U.S. currency. But the nearest federal reserve bank is in San Francisco (although that district has a Seattle branch). And much of Alaska is far from a commercial bank branch. All of this must mean that it is expensive to replace old currency with new, at least through the normal bank-system-channels. So the currency they use is old and quite worn! I should insist on a discount from merchants who receive the crisp bills I brought from IL and/or make me change with worn bills that I'll bring back to IL. Market arrangements like these would help solve the problem of supplying crisp currency to Alaska. I'll let you what the AK merchants think of my theory! Did May Move toward a Housing Recovery? 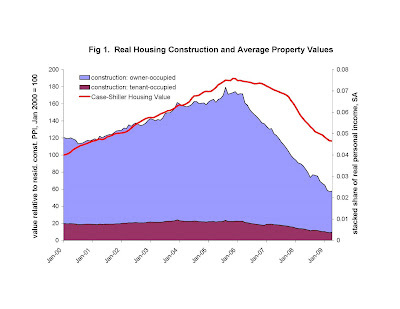 "...it has been no surprise that the housing bust has been characterized by: (a) sharply falling housing construction, (b) sharply falling housing prices, and (c) costs of home construction that have fallen, but not as much as housing prices have. If it were not for the fiscal stimulus, a housing recovery would have all of these elements in the opposite direction. When it happens, the fiscal stimulus will add a wrinkle: more of the housing recovery may be in the form of rising prices rather than rising construction activity (that's crowding out)." I already noted that housing construction employment continued sharply down in May. But this morning's housing starts report suggests that June construction activity might improve, because (seasonally adjusted) single-family housing starts were higher in May than they have been in six months. Starts for multi-family units fell, though. 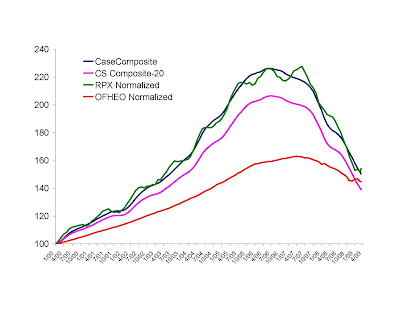 Next we need to see housing price indexes reported by OFHEO and Case-Shiller increase by more than the construction PPI increases (the May values of the housing price indexes will not be released for another six weeks), and to see more actual housing construction (May value to be released July 1). In the bush country of Alaska, people live miles from the nearest road. They get around by boat, "bush plane," snowmobile, or even dog sled. The bush country residents are proud of their self-sufficiency. The few tourists who go there are impressed. I am not talking about admiration of nature. 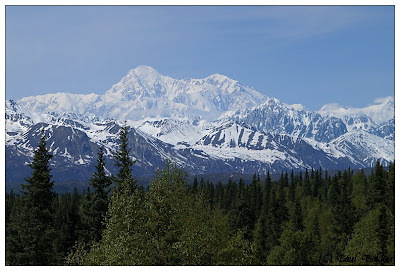 Alaska has millions of acres that seem undisturbed by people, and it is awesome to see it. But, as many people do, one can admire nature without being self-sufficient. Indeed, like the Grand Canyon or Mt. McKinley, the market is one of the wonders of the world. Although a trip to the top of Mt. McKinley is expensive and sometimes deadly, the market is one of those wonders that pays you to visit it, and helps you live longer. So why is self-sufficiency a source of pride? Mortgage Modification has an Asset Test Too? Jack Guttentag has a wide audience whom he helps squeeze the maximum out of mortgage lenders. I appreciate him because he helps refute the "borrowers don't know how to exploit incentives" objection to my theory that mortgage modification is bad for the economy. "To be eligible to have your payment reduced under [government's Home Affordability Modification Program], you must document not only that your income is insufficient to meet the payment but also that you do not have "sufficient liquid assets" to make the payment. I have scrutinized the specs for this program issued by Treasury, and could not find a definition of either "sufficient" or "liquid assets." It is a thorny issue that Treasury elected not to deal with. In effect, this leaves it up to the servicers to decide, raising the prospect of widely divergent approaches. ...My guess is that few if any borrowers are going to get caught by the "sufficient liquid assets" rule." The government is spending a lot -- too much -- these days, but that's not why we should expect inflation. Inflation is coming for two reasons: (a) the Fed has dramatically expanded the money supply (see also here), and (b) it would be inefficient (and perhaps also politically unpopular) for the Fed to try to stop it. The inflation we'll get would have happened even without the excessive government spending put in motion by Bush and Obama. Moreover, we should welcome it, rather than complain. The only puzzle is when, because the short run relationship between money supply and prices is very weak. 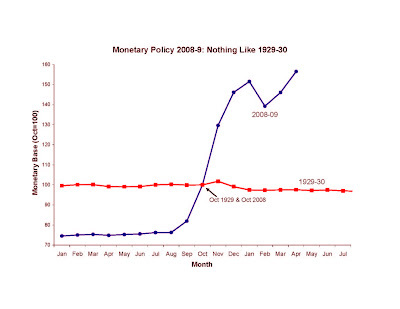 The chart below compares monetary policy, as measured by the size of the monetary base, in 1929-30 with 2008-9. The red line measures the (seasonally adjusted) monetary base in each month through July 1930, normalized so that October 1929 is 100 (for example, the value of 99.2 in April 1929 means that the monetary base then was 0.8 percent lower than it would be in October). As you can see, the monetary base evolves very differently now than in 1929-30. Back then, the monetary base fell somewhat (Milton Friedman and Anna Schwartz long criticized the Fed for that, blaming the deflation and a significant part of the Depression on the Fed's failure to expand money). 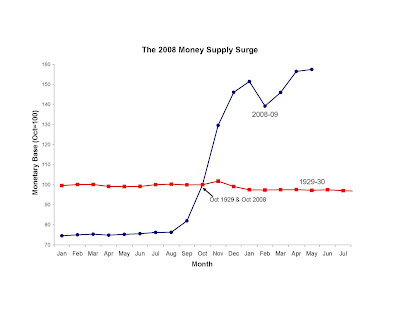 In the fall of 2008, the monetary base exploded. You might say that is exactly what Friedman and Schwartz would have them do (although Friedman's AEA Presidential Address says "no sharp turns" -- the chart above looks like a sharp turn to me). Using the same format as the chart above (except no seasonal adjustments, as those CPI adjustments are not available for 1929-30), the chart below shows the CPI in 1929-30 and 2008-9. Despite the dramatic difference in monetary policy, I fail to see a dramatic difference in the CPI. Of course, the CPI continued to fall for a long time after 1929, so maybe we can look at this graph a year from now and see a more obvious difference. (1) My ebay auction for 4 tickets to the (usually wildly popular) Sox @ Cubs game next week has zero bids, even though the price starts at face value. (2) After my begging them for 10 years in vain to have my season ticket location improved, the Chicago Bulls asked me multiple times today if I would like some better seats next year. I am thrilled to be asked (I said "yes"), but these circumstance must indicate that ticket demand is seriously depressed. (1) A General Theory, of Employment, Interest and Money. This is the most widely known book, which is incorrect or at best unintelligible. So-called "Keynesians" -- such as people who (erroneously) believe that government spending encourages private spending -- look back to this book. (2) A Tract on Monetary Reform. In contrast, this book is easy to understand, with some elegant passages describing basic tenets of economics such as the fact that printing money, printing government debt, and levying taxes are really all the same thing -- the government's taking purchasing power from the people. (3) The Economic Consequences of the Peace. It is very rare that economists say something that is: (a) of huge world wide importance, (b) the opposite of conventional wisdom, and (c) obviously correct in hindsight. Keynes' Economic Consequences of the Peace is one of those instances. Philipson and Posner's Private Choices and Public Health is another. Milton Friedman's Capitalism and Freedom may be another. Today I wrote in the New York Times' Economix blog that the Economic Consequences of the Peace might be the most insightful and important economics books ever. I expect that commenters -- unaware that Keynes' writings are not all of the same quality -- will think I refer to the General Theory and say something like "at last someone at the University of Chicago is a Keynesian." If appreciation of Economic Consequences of the Peace is what constitutes Keynesianism (it is not), then the University of Chicago has been leading Keynesianism for almost 100 years! P.S. If you need some strong praise of Milton Friedman, tune in next Wednesday. The federal government is spending a lot these days, and going deeply in debt. Although it is easy to imagine high inflation as a consequence of excessive government spending, inflation rates and government spending are weakly correlated, if correlated at all. John Maynard Keynes wrote the most important and insightful economics book ever — “The Economic Consequences of the Peace” — successfully predicting an instance in which excessive government spending would create inflation, and worse. Published shortly after World War I, the book analyzed the economic capacity of Germany, and explained how it was not nearly enough for the German government to pay the debts (“reparations”) imposed on her by the Allied powers’ Treaty of Versailles. Dire political and economic consequences would result from the excessive debt burden created for Germany by the Treaty of Versailles, Keynes wrote. The Allied powers did not reduce the reparations nearly as much as Keynes recommended; the German economy and polity subsequently produced hyperinflation, the Holocaust and violent contributions to World War II. The Bush and Obama administrations have added, and continue to add, much to the United States’ national debt. Both Republicans and Democrats spend too much of taxpayers’ money, but excessive government spending does not mean that inflation will necessarily — or even probably — follow. The Treaty of Versailles gave Germany debts that amounted to years of the nation’s gross domestic product, whereas 2008-9 bailout mania has so far given us debt that amounts to “only” several months’ G.D.P. Moreover, thanks to the emergence of payroll taxation and income tax withholding, the capacity of governments to tax its citizens without resorting to inflation is much greater than it was before World War II. Neither inflation nor war will be needed to settle the debts that Presidents Bush and Obama are giving us. Last year the Federal Reserve Board’s Song Han and I published a study of 80 countries where we looked at the correlation between inflation and government spending. We found inflation to be similar (or even somewhat less) in countries whose governments spend more for nonmilitary purposes as compared to countries whose governments spent less. Our study found significant positive correlations between inflation and government spending only in cases when military spending grew — as it does during wartime. But the government spending growth we have seen in 2008 and 2009 comes from the nonmilitary part of the budget. Taxpayers will suffer as a result of the federal government’s recent and excessive spending, but a great many taxpayers around the world have faced similar liabilities, while nonetheless experiencing modest or low inflation. The AP reports "Consumers could receive rebates of up to $4,500 for turning in their gas-guzzling cars and trucks for more fuel-efficient vehicles under a House proposal. President Barack Obama has urged Congress to approve consumer incentives for new car purchases as part of the government's efforts to reorganize General Motors Corp. and Chrysler LLC through the bankruptcy courts." A noble goal! But it has the opposite of the intended effects because it rewards people who bought gas guzzlers in the past and gives no reward to those who bought fuel efficient vehicles. I can hear you saying that you did not consider this when you purchased your vehicle, and that you doubt that Americans were clever enough to anticipate this. Well, not everyone can be as smart as Chicago cab drivers, or people who bought Hummers in 2008. According to the employment report released by bls this morning, employment in the "Residential building" industry continues down at the same steep rate. At the start of this recession (December 2007), 48.7 percent of payroll employees were women. By April 2009, their percentage passed 49.7. About a month ago I noted that it was possible that women's percentage would pass 50 in this recession IF it got significantly deeper. Today's employment report suggests that employment losses are slowing. Moreover, the employment losses March-April 2009 were less overwhelmingly male than they have been in previous months. 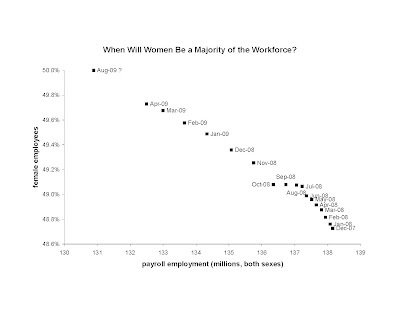 Thus, it appears that women will remain a slim minority of payrolls for the near future. 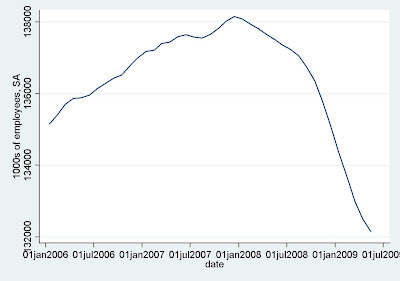 The chart below shows U.S. nonfarm payroll employment (in thousands) January 2006 - May 2009. By May, it had fallen to 132.2 million, which I admit is less than the 134 million floor I set last fall. The BLS updated its productivity estimates for 2009 Q1, and reported the results this morning. 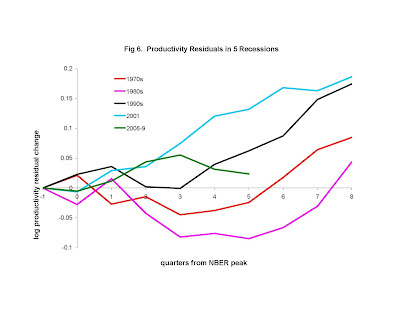 The chart below (an update of Figure 5 in my NBER wp) shows the productivity residual in this recession and four previous ones. The productivity residual clearly fell 2008 Q3 - Q4 -- that is productivity has not risen as much as you might expected given the drop in hours. However, the BLS release today suggests that the productivity residual hardly fell 2008 Q4 - 2009 Q1 and remains significantly higher than it was when the recession began. The two worst quarters of this recession are not near as bad (in terms of productivity residuals) as the two worst quarters of 1981-82. 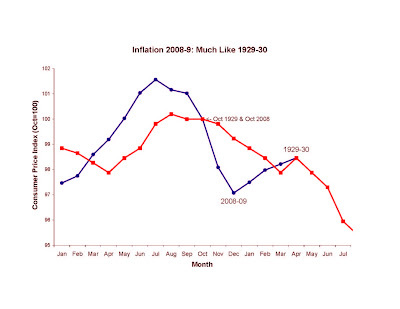 The chart below graphs inflation-adjusted G.D.P. 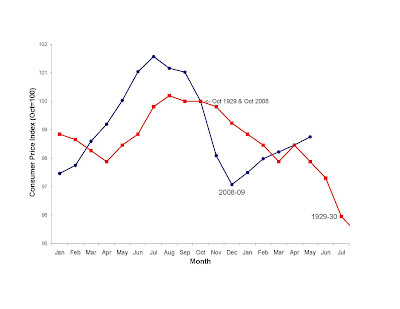 indexes for late 1979 through the end of 1982 (the blue series) and for mid-2006 through the first quarter of 2009 (the red series). Each point represents G.D.P. as a percent of the G.D.P. level three years before the given recession ended. Because the downturn of the early 1980s was officially over by the last quarter of 1982, the blue series shows the dynamics of real G.D.P. for the three years (12 quarters) before the end of that recession. Real G.D.P. had its ups and downs in those three years, but by the end it was 0.3 percent lower than it was three years earlier. The current recession is not over. But supposing that it ends in the third quarter of 2009, the red series provides a preview of the analogous calculation for 2008-’09. The red series shows how in the late 2000s G.D.P. rose significantly for much (but not all) of the three years before the end of the recession. By contrast, the early 1980s (blue) series shows two recessions in the three years before the downturn’s end. In a sense, the 1981-’82 recession damaged an economy already tender from the 1980 recession. Measured from the start of the first recession, the early 1980s recession lasted 34 months whereas this recession is so far “only” 17 months old. The usual comparisons of the current recession to 1981-’82 are based on the worst two to four consecutive quarters, without regard for the other activity near and around that time. 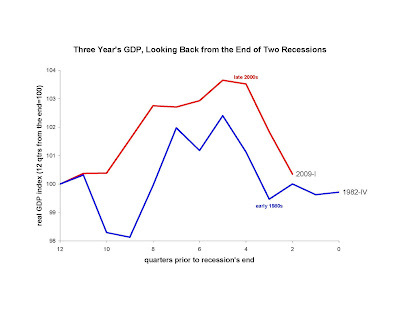 For example, the worst two quarters of this recession (so far) have seen G.D.P. fall 3.1 percent (from an index in the chart of 103.5 to 100.4) whereas the worst two consecutive quarters 1980-2 were late 1981 and early 1982, when real G.D.P. fell 2.9 percent. Arguably, we would like to see real G.D.P. fall 3.1 percent rather than 2.9 percent in two quarters, as long as the former case had some other good growth quarters. The chart illustrates this idea: the red series (late 2000s) is consistently above the blue series (early 1980s) despite the fact that the red series has the greatest two-quarter descent. We do not know for sure when this recession will end, let alone whether it will be soon followed by a second recession. 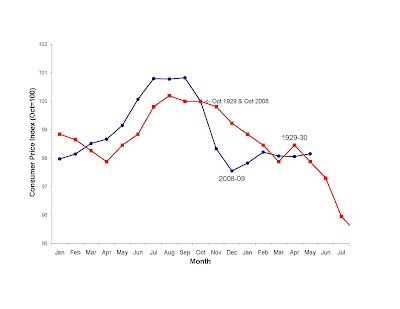 The red series may well dip slightly below the blue series in the second quarter of 2009 but that does not change the fact that real G.D.P. growth in much of the late 2000s was better than it was in the early 1980s. While the job losses, foreclosures, stock declines and other casualties of the current recession have been very painful, substantially more bad economic news is needed to make this recession worse than the downturns of 1980-’82, at least in G.D.P. terms. In 2008, we were told that each American taxpayer had to spend thousands on bank bailouts in order to avoid utter disaster. We were not supposed to object, because a few thousand is a cheap price to pay for disaster avoidance. In early 2009, we were told that each American taxpayer had to spend thousands on fiscal stimulus in order to avoid utter disaster. We were not supposed to object, because a few thousand is a cheap price to pay for disaster avoidance. Now we are told that each American taxpayer has to spend thousands (? amount to be unveiled later) on government health care in order to avoid utter disaster. We were not supposed to object, because a few thousand is a cheap price to pay for disaster avoidance. We are lucky to have the White House to save us from so many disasters! Earlier I suggested that, even if the Obama Administration was significantly more anti-merger than Bush's, the impact on efficiency and the consumer might be minimal because mergers are substitutable across time. This intertemporal substitution effect operates less regarding DOJ regulation of business' pricing and marketing policies. Professor Priest in today's WSJ suggested another reason Obama might have little impact on anti-trust policy: (he claims) anti-trust law is ultimately determined by the Supreme Court, and (even with a couple of Obama appointments) the Supreme Court will not completely overturn its precedents. Of course (assuming again that the Obama Administration makes a genuine change), businesses will have to spend more on legal fees and economic experts to continue pursue some of the practices they did under Bush. Some of those businesses will decide not to fight DOJ (due to the legal expense) and instead just change their practices. Other business will fight, or credibly threaten to fight, DOJ all the way to the Supreme Court. Presumably the former cases would involve practices that are less valuable in terms of enhancing efficiency or stifling competition (that's why they are outweighed by legal fees) whereas the latter cases involve the practices that matter the most. This kind of selection bias suggests that the most valuable practices disapproved by the Obama Administration but approved by the Supreme Court will survive. Commenters -- what do you think -- is anti-trust really in for a big change? The BEA reported that real disposable personal income was $2442 per person in April 2009. The only month in U.S. history higher than that was May 2008 ($2499). The chart below shows monthly seasonally adjusted construction spending separately for residential and non-residential. Non-residential spending increased for the third straight month, and remains higher than it was when the recession began. Residential construction spending increased for the first time in eight months. The BLS producer price index for residential construction fell from March to April, which may indicate that real residential construction increased significantly from March to April.